These Banana Muffins are loaded with crunchy walnuts and sweet cinnamon, then topped with a sugary crumble no one can resist! It sounds silly, but breakfast is often the hardest meal for me to prepare and eat. That’s why I always keep recipes like Banana Muffins on hand so I can bake them ahead of time, then grab one as I head out the door! 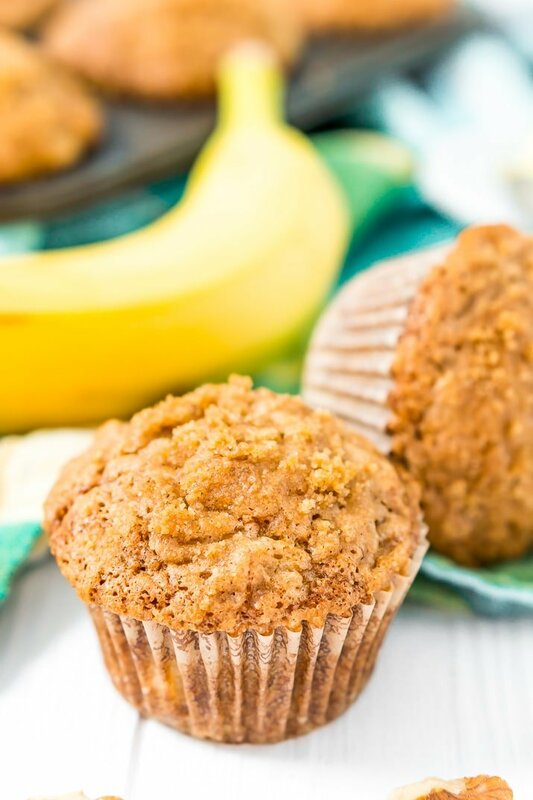 These Banana Nut Muffins are as tasty as they are convenient, and they’re perfect to feed the whole family in the midst of morning chaos. If you struggle to get your kids to eat something before they start their day — heck, maybe it’s a challenge for you, too — these crumbly muffins will make your mornings a little bit easier. JUST TAKE ME TO THE BANANA MUFFINS RECIPE ALREADY! 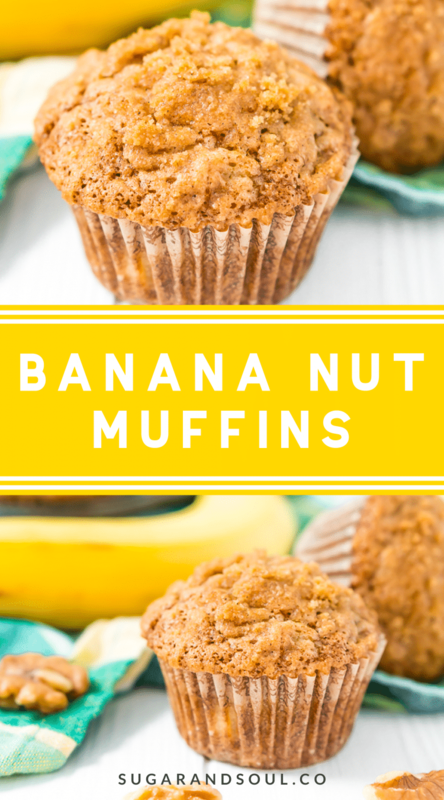 If you’d rather skip my (very helpful, I think) tips and tricks, essential cooking info, and similar recipe ideas – and get straight to this deliciously easy Best Ever BANANA MUFFINS Recipe – simply scroll to the bottom of the page where you can find the printable recipe card. They’re also a wonderful treat to enjoy during leisurely brunches, combining the nostalgic flavors of banana bread and coffee cake. Plus, there are no utensils required… unless you want to spread on a little butter, of course! Packed with crunchy walnuts and topped with a cinnamon and brown sugar crumble, even the pickiest eaters will love these sweet muffins. And if anyone in the family doesn’t like nuts or is allergic to them, don’t worry, just don’t add ‘em. Best of all, this recipe is super simple to make. In fact, you can whip up a batch in about 35 minutes. I always enjoy my Banana Muffins with a fresh cup of coffee (yes, sometimes it’s a to-go cup), or with a mug of tea as an afternoon snack. After all, who said that muffins were only for the morning? Whenever I have bananas that get too ripe, I try to incorporate them in a recipe rather than toss them out. Banana Nut Muffins are a great way to use those brown bananas, and their overripe sweetness actually makes the muffins taste better! 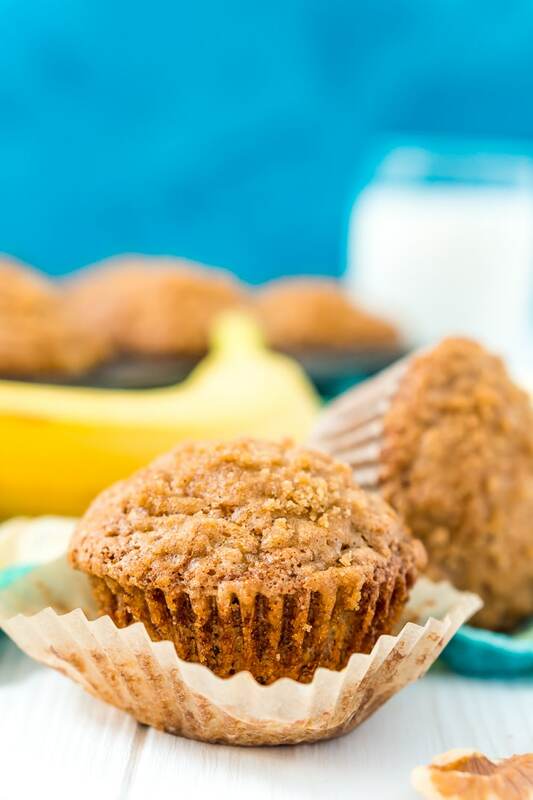 Whether you need a quick bite, a use for your brown bananas or you just want something scrumptious to savor, these crumbly Banana Nut Muffins are sure to be a family favorite! 1. Extra Ripe Bananas Always! – Yes, you can take a barely ripe banana and mush it to the point where it would technically work for this recipe, but you’d be leaving a whole lot of flavor on the table! For best flavor, make sure your bananas are fully brown or even black, this means that those bananas that have been sitting on the counter for 3 weeks are absolutely perfect for this recipe! 2. Use A Fork – Just like momma used to do, a fork really is the best way to mash a banana and reduce the number of lumps! 3. Mix by Hand – I know in a world of KitchenAids, it seems like a foreign concept, but this will prevent overmixing and make for lighter and fluffier muffins. Plus, this recipe uses oil instead of butter so it’s very easy to mix everything with a large bowl and a wooden spoon. 4. Walnuts are Optional – Personally, I love them, but I know not everyone likes them or can eat them. So feel free to leave them out OR replace them with chocolate chips for some banana chocolate chip muffins! 5. Use a Measuring Cup for Distributing – By using a 1/4 cup measuring cup to distribute your batter into the muffin tin, you’ll ensure evenly sized and perfectly baked muffins! 7. Share them or Freeze them – If you have a lot of banana muffins left over, freeze them for a later date. Just let the muffins cool to room temperature before transferring them to a gallon sized freezer bag. If you plan on enjoying them one at a time, wrap each muffin individually with plastic wrap. When you’re ready to enjoy one, take it out and let it thaw on the counter for a few hours. 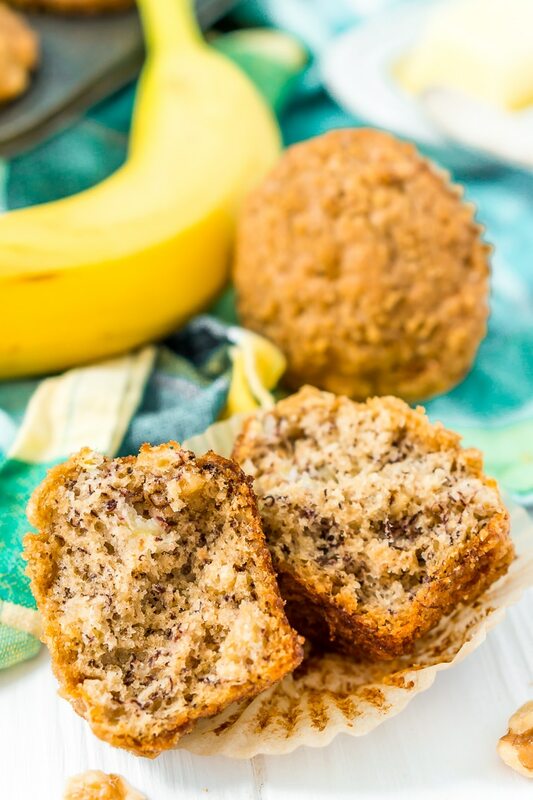 Pin these Banana Muffins for Later! Preheat oven to 375 degrees F. Line a muffin tin with liners and set aside. 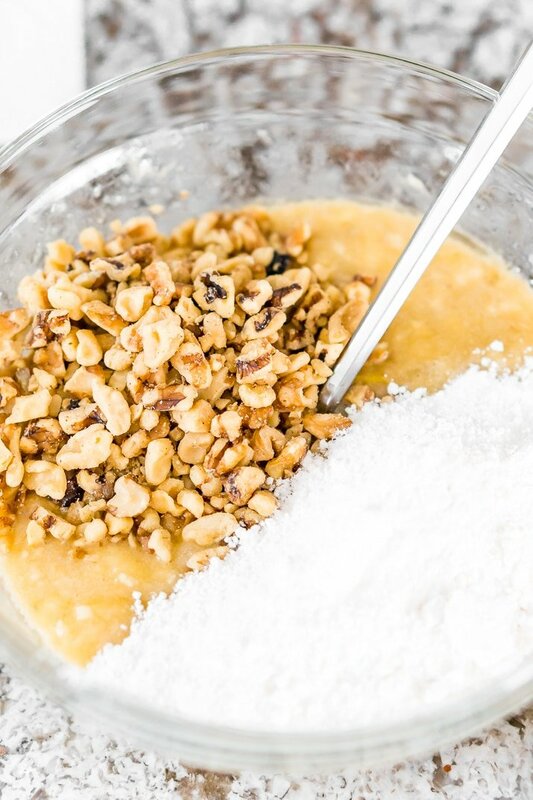 Whisk together the flour, sugar, baking soda, and salt in a medium bowl and set aside. In a large bowl, mash the bananas with a fork until only small lumps remain. Mix in the egg, vegetable oil, vanilla, and walnuts. Add half of the dry ingredients to the wet ingredients and mix just until combined. Add in the rest and mix just until combined. Use a 1/4 cup measuring cup to measure the batter into the baking liners. In a small bowl, mix together the topping ingredients and mix with a fork or your fingers until a fine crumble forms. Sprinkle the crumble over the top of the cupcakes and bake for 18 to 22 minutes. I love to have muffins handy in the freezer for just those type of mornings when I just can’t get something on the table quick enough before having to rush out of the house. 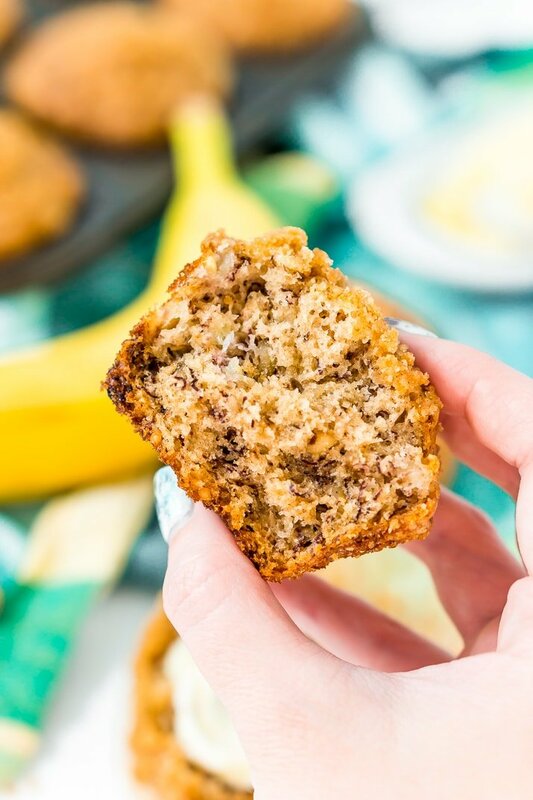 These sound absolutely delicious with my favorite banana bread (which is my go to for ripe bananas too or maybe a smoothie) and lots of crumbs on top. I still mash my bananas with a fork and mix by hand too so there are still a few of us out there. Great recipe and love the cinnamon addition. Yes, they are perfect for those crazy mornings!